Since Avast acquired Piriform, the popular system cleaning software CCleaner has become bloated with malware, bundled PUPs (potentially unwanted programs), and an alarming amount of pop-up ads. This is quite unfortunate, as CCleaner was once highly regarded as one of the best system cleaning tools available freely on the market. To make the situation even worse, the latest update to CCleaner removes privacy settings (the option to share your data with third-parties for ‘data analytics’), and forces active monitoring to always be enabled. This means that you cannot quit CCleaner, it must be manually terminated from the Windows task manager. 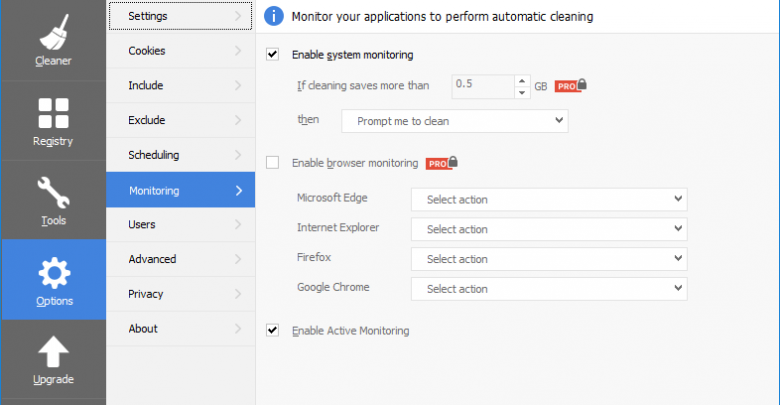 In previous CCleaner versions, active monitoring was an optional feature that could simply be permanently disabled. But now if you go into the Options menu and disable active monitoring, it will automatically re-enable itself upon CCleaner being launched, or your computer being rebooted. Furthermore, Avast has removed the ability for users to quit the software. If you close CCleaner, it simply minimizes itself to your system tray. Right-clicking on the CCleaner icon only brings up the options to re-open CCleaner or run a system clean. There is no Quit button, and CCleaner must be manually terminated via Task Manager. “In CCleaner v5.45 we extended existing analytics functionality in the software in order to gain greater insight into how our users interact with the software. This data is completely anonymous, and through collecting it we can rapidly detect bugs, identify pain points in the UI design and also understand which areas of functionality we should be focusing our time on. Most modern software companies collect anonymous usage data as it is very helpful when prioritizing bug fixes and future improvements in the product experience. For example, we can see that many of our users have upgraded to the Professional edition but have never switched on the ‘scheduled cleaning’, which is one of the main benefits of the paid product. From this we know we need to work harder to make this paid-for feature more obvious in the CCleaner UI. When it came to adding the new analytics, the simplest way to do so was to extend the ‘Active Monitoring’ feature. Active Monitoring has been in CCleaner for a number of years and is essentially just some intelligent triggers for alerting you to clean out junk data when a lot of it has accumulated, and also for keeping you updated with the latest (and safest) cleaning definitions. Scary name aside, these contextual cleaning alerts help to remind people that cleaning is more of a maintenance task than a one-shot solution. Over time junk files will continue to be generated and more tracking files added and these alerts help our users to stay on top of that. So in a nutshell, Avast is admitting that they’ll be taking this opportunity over the next few weeks to collect as much user data as possible, then release future updates that bring back some semblance of control to the user. If you’re highly dependent on CCleaner, there’s a few things you can do to avoid some of this. For starters, you can try installing the portable version of CCleaner, which has no install, no active monitoring, and does not remain in system memory when you shut it down. Delete only the CCleaner entry on the right pane. Close the Regedit program – changes are automatically saved. Under the Task Scheduler Library – delete the one or two ccleaner entries by right-clicking on them.